We envision a future where interactive devices are not manufactured but are living, growing organisms. Botanicus Interacticus is an exploration into the design of highly expressive interactive plants, both living and artificial. It has a number of unique properties. The instrumentation of living plants is simple, non-invasive, and does not damage the plants. Using our Touché technology, only a single wire has to be placed anywhere in the plant’s soil. Botanicus Interacticus allows for rich and expressive interaction with plants. Depending on the physiology of each plant species, Botanicus Interacticus can allow a broad variety of gestures such as sliding fingers on the plant stem, detecting touch and grasp location, tracking proximity between the user and plant, and estimating the amount of touch contact. 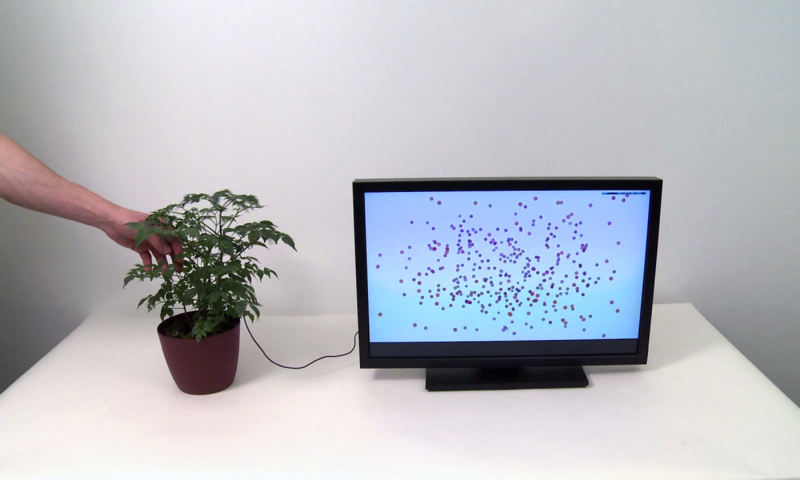 With Botanicus Interacticus technology any living plant can be turned into a musical instrument, a game controller, a light switch, an elevator button, or a motion detector. Interactivity and responsiveness can be added to homes, streets, and even entire cities, unobtrusively and sustainably simply by growing plants. The Botanicus Interacticus was developed at Disney Research by myself in collaboration with Philipp Schoessler, Jonas Loh/Studio NAND, and Munehiko Sato. The project is based on Touché sensing technology invented earlier at Disney Research, Pittsburgh. Christian Riekoff, Eric Brockmeyer and TheGreenEyl joined Botanicus Interacticus research team on designing and producing the SIGGRAPH 2012 Botanicus Interacticus exhibition.